A long cherished desire of the educationally backward populace of Talappilly Taluk became a reality when Jnanasahramam Trust, a monastic order doing yeomen service in different areas started Sri Vyasa College atop Vyasagiri hillock in 1967.The foundation stone for the college was laid down by late Sri M.K.K.Nair on 9th April 1967.The college started functioning with four Pre-Degree batches. It was after Nair Service Society took over the reins of administration in 1971-1972 that the college got elevated to the rank of a Degree College with the commencement of B.Com Degree Course in 1975-1976.Later Graduate Courses in Chemistry(1976), Physics(1980), Mathematics(1981), Economics(l982),Botany (1993),English (1998) & History(1999) were started. Post Graduate Courses in Chemistry(1982) & Physics (2000) elevated the status of the College to a First Grade P.G College. In the mean time, Pre-degree got delinked from colleges. The College celebrated its Silver Jubilee in 1992. The celebrations were inaugurated in February by the then Hon. Vice President of India, Sri K.R. Narayanan. 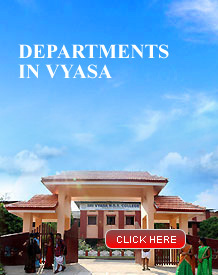 Apart from the laudable strides made in the academic field, Vyasa has an enviable track record of twinkling extension activities spreading throughout the length and breadth of Thalapilly Taluk. The college has never hesitated in extending its hand of co-operation to the three tier Panchayathi Raj administration for improving life standards of the people of this Taluk. This is a minor way of showing gratitude to the catchment area of Vyasa which provides the moral and material sustenance for this institution to move forward with unfaltering sure steps in the path of higher education. Vyasa has contributed considerably to the sports canvas of the nation with a galaxy of glittering stars particularly in atheletics, kho-kho, weightlifting and football.